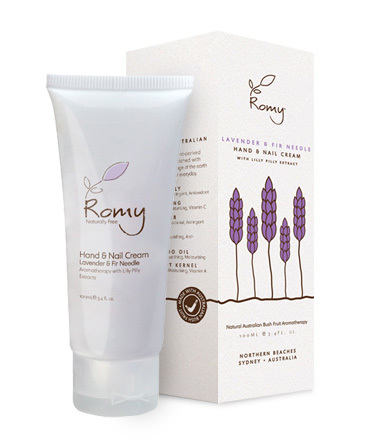 ROMY Lavender & Fir Needle Hand & Nail Cream absorbs quickly into the skin. It does not leave hands greasy and the wonderful aromas linger on the skin. It is packed with green tea and lemon grass extracts, as well as apricot, eucalyptus and avocado (Vitamin E) oils. "awsome hand cream, I use it on my feet too. fast shippment to Perth, good service"